"Hi, I'm 9 years old and last year in the Laura Ingalls Wilder pageant in Walnut Grove, MN, I played Carrie Ingalls," wrote young Victoria Bayer just before Christmas. She was writing to Lindsay and Sidney Greenbush, the twins who shared the role of Carrie in the Little House on the Prairie television series. "Have you ever been to the pageant?" she questioned. Lindsay Greenbush promptly responded. "No, but I would love to attend." A week later, the announcement was official: The Greenbush twins would be making a special appearance at Walnut Grove on July 19, 2008. Nearly 1000 fans turned out to see the twins, who hosted a question and answer session, in addition to touring the museum and watching the pageant, "Fragments of a Dream." A special moment occurred when the girls, having grown up playing along television's version of Plum Creek, stood on the banks of the real Plum Creek, on the Ingalls family's farm. We have invited Victoria to share her experience of meeting the Greenbush twins in person. Hello! I am Victoria Bayer. I am ten years old and I interviewed Lindsay Greenbush, who played Carrie Ingalls (along with her twin sister Sidney) on the "Little House on the Prairie" TV series. It all started when I played Carrie last year in the Laura Ingalls Wilder pageant in Walnut Grove, MN. My dad found the email fan club group for the Greenbush Twins and we joined it together. There are lots of people on the list. I asked the twins if they'd ever been to Walnut Grove and they said no. They asked for some information and I sent the Walnut Grove link to them. Then a little while later we got an announcement that they were going to come. I was really excited. All of the pamphlets and billboards said "guest star appearance." My mom told me I should ask to interview them for a homeschool project and they said yes. So I emailed them my questions and Lindsay emailed me her answers. We printed them out and gave them to the newspaper editor and he published them in the Sentinel Tribune. They came to Walnut Grove while the pageant was going on and they gave a speech and answered questions at the park. The girl who played Carrie this year and I got to go on stage with them. I asked them what they liked to do for fun back stage. They said they liked to play backgammon and later they had a weight room. They weren't supposed to be in there but they were bored sometimes and would use it while the rest of the cast was filming. Sometimes they'd have a weight in the air and when the buzzer sounds that means you have to be quiet. They couldn't put it down because that would make noise so they'd have to keep it in the air the whole time or really, really quietly put it down. After they answered questions, they signed pictures of themselves. There was a half a block long line and I got to get an autograph immediately. That made me feel lucky. Some newspaper reporters took my picture with Sidney and Lindsay. The Marshall reporter chased me down and she kept shouting "pigtails!" to get my attention since I had braids in my hair. Then she asked my name and phone number and later she called and asked more questions over the phone. When the paper came out, we saw that I was on the front page with the Greenbush twins and the headline was "Thanks to Victoria." It was amazing to be a part of this. I'll remember it forever! Thank you, Victoria, and thank you, Lindsay and Sidney for generously giving of your time to meet your fans in Walnut Grove! 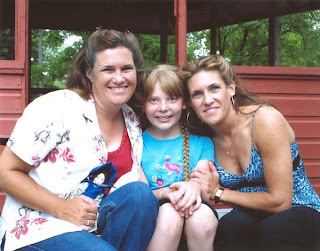 August 23, 2008: Lindsay Greenbush will be appearing at Pioneer History Day in Simi Valley, California. Autograph sessions and a Q&A session with Lindsay will be scheduled throughout the day. Click here for details. September 5-7, 2008: Lindsay and Sidney Greenbush will attend Holy Terror Days in Keystone, South Dakota. Call (605) 343-7800 for more information.